Shop narrow switch plates and offset outlet covers for tight spots by cabinets or tiling. Find undersized 2.5", 2.25", 2", 1.75", or 1.5" sizes for toggle switches, receptacles, cables or blank electrical boxes plus narrow 2-, 3-, or 4-gang plates. See Narrow Switch Plate Tips for ideas and solutions for unusual or particularly challenging situations. Q. Is a narrow electrical box needed when using narrow wall plates? A. No, you do not need a narrow wall box. 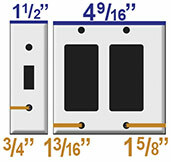 Standard electrical boxes are 2.12" wide and are flush mounted with the wall paneling, Sheetrock or plaster. 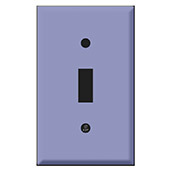 Narrow light switch and outlet covers are typically needed when obstructions (moulding, cabinetry, tiling, etc.) are butting up against the electric box or are slightly covering it. The narrow switch plates will fit into the tight spaces between obstructions, hiding the exposed part of the box. (Electrical boxes can't be narrower because they still must provide clearance around the electrical devices that are mounted in them.) Consult an electrician regarding codes for your installation. Here is a very common situation in which a narrow or trimmed cover plate is needed. This DIY-er added a beautiful tile backsplash to a wet bar. The switch and outlet already existed, but the addition of a bullnose edge on the left ate into the space that was needed for the cover plate. 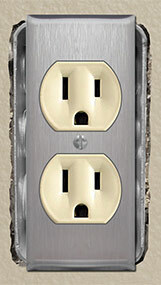 The easy solution was this narrow switchplate that has offset cutouts, leaving a trimmed or smaller left side. The homeowner previously had a toggle light switch on the left, but simply updated to a rocker switch in order to use this slim cover plate, which was a perfect fit! Note that all plates may be rotated if you need the opposite edge to be narrow or trimmed to fit your space. Depending on how narrow you need your switch plate to be, Kyle Switch Plates carries standard single gang wall plates that measure 2.75" wide and a variety of narrower sizes all the way down to 1.5" in some configurations. Narrow plates are the same 4.5" height as standard sizes. They are great for kitchen backsplashes and kitchen islands as well as other tigh spots like next to a cabinet, a built-in desk or entertainment center, fireplace, wainscotting, or board and batten. Sometimes referred to as storefront door plates because they look like the narrow strike plates on heavy duty store front doors, these skinny light switch covers can help get you out of a jam. 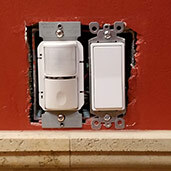 Kyle Switch Plates exclusive small switch plates and offset outlet covers in narrow sizes are the solution for awkward corners and other areas where there isn't enough room for a standard sized cover plate. In these situations, install a skinnier, narrow switch plate. Undersized plates range from 1.5" to 2.25" wide and fit your standard size devices - toggle switches, rocker switches, despard switches and outlets. Add a thin switch plate where your remodeled kitchen or bathroom cabinet was installed too close to your old outlet. Put them in any tight space - near door frames, window mullions, office partitions, RVs, trailers, boats, mobile homes or corners. Industry standard plates are 4.5" high by 2.75" wide. Standard sized plates cover an electrical box with little room to spare around the edges. Easily extend these 2.25" switch plates to a width of 2.5" with a narrow plate extender. Compare all narrow plate sizes & dimensions here. Will a Narrow Plate Fit? 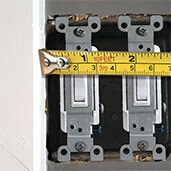 See tips for measuring side obstructed switch plates. 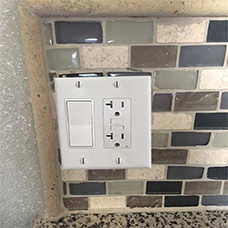 Is your switch cover being obstructed on the top by cabinets or on the bottom by wall tile? 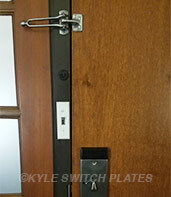 For switches installed inside a door jamb (such as in hotels or offices with glass walls), narrow plates offer the perfect solution. Here's a close-up view of the narrow door jamb cover in the hotel room shown above. Choose from a variety of narrow wall plate sizes to fit your needs. CAUTION: Check local safety codes before covering an electrical box with certain materials.